The first obligation of government is the protection of the welfare and well-being, indeed the very existence, of its citizens, presidential nominee Franklin D. Roosevelt said at the 1932 Democratic National Convention. Since then, successive waves of progressives have worked to expand and extend the government through Harry Trumans Fair Deal, LBJs Great Society, Bill Clintons Third Way, and Barack Obamas transformative Obamacare. The only president who sought to reverse the swing to socialism was Ronald Reagan, and even he said he would not attempt to do away with the New Deal. 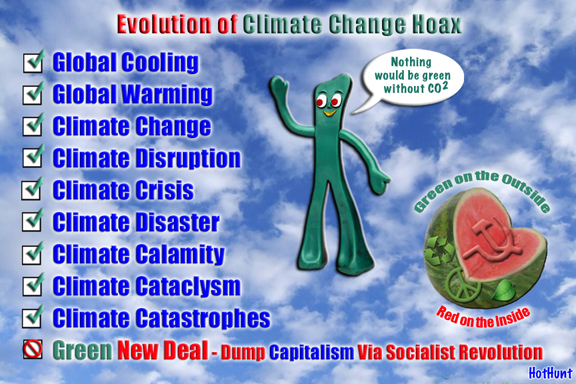 Sponsors of the Green New Dealincluding Ocasio-Cortez, D-N.Y., and Sen. Ed Markey, D-Mass.list these goals: Phase out conventional fuels (that is, oil, natural gas, and coal) by 2030, only a decade from now; implement a federal jobs guarantee; retrofit all U.S. buildings; overhaul transportation with high-speed rail; and provide universal health care. Scant mention is made of the cost of this radical retrofit of America and who would pay for it. Its easy being green when all you have to do is pick other peoples pockets. It’s like Christmas for the elites at the top ? I think it’s true purpose is to start a process of horse trading that will greatly increase the level of Socialism in this country. We’ll end up accepting “free” college and national health care, while breathing a sigh of relief that we got to keep airplanes and hamburgers. The thing is just chock-full of straw men for negotiating. "blueprint to turn America into a socialist communist state"
Don’t write off AOC as a nutcase. Polls show that 70% of the people say they would vote for her for president and she will be 35 Oct 13, 2024. I read that she would lose to Trump by 3, which I don’t believe. COMMON SENSE alone dictates that the 50 percent plus that voted for Trump only TWO YEARS AGO wouldn’t vote for her. I believe she would lose to him by MORE. We can hope she is laughed completely out of the running before 2024. If some nutcase like her got elected,I’m afraid she might be the ruination of this country in ways that Obama only dreamed of. Well end up accepting free college and national health care, while breathing a sigh of relief that we got to keep airplanes and hamburgers. If we do such a thing, we deserve what we get. Virtually all of the young people I talk to are aware of the social benefits in European countries. They think that is just peachy and see no idea why it can’t be done here. And I’m afraid as soon as enough of us die, it will be. If she is ever elected president then by God it will be time to use the 2nd. Amendment for the very reason the Founders left it to us. Unfortunately, the half of America that voted for the homosexual Communist is stupid enough to vote for this hateful qitch. The people are uneducated fools for the most part and believe everything could be free if the rich weren’t so greedy. Trump won’t be running in 2024. Trump wont be running in 2024. Then it will be President Abbott.